↑ "Audrey Hepburn tops Beauty poll". BBC. 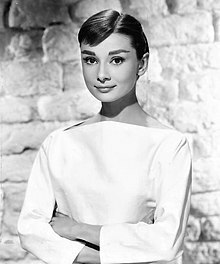 ↑ "'She thought she had a big nose and feet, was too skinny and not enough breast': Audrey Hepburn's son reveals how the movie star never believed she was beautiful". Daily Mail. ↑ "Hepburn, Audrey". Oxford Dictionary of National Biography. Oxford University Press.